A dear friend of mine has recently bought a CD full of theatrical tidbits that someone had collected over time. In it there are some lovely video clips from the Jane Eyre musical when it was on Broadway. I haven’t seen most of these- my computer is still not up to the job, but that’s no reason not to share the links! They will be up for less than a week. There are also some audio files and photographs. I haven’t listened to these, either, but apparently the lyrics are different from other renditions: Sirens, Secret Soul. I’ve posted some of the photos throughough this post btw (or I will do when Blogger will allow it…). I have been silent lately, due to more than one crisis at home, which are now resolved, God willing. Exam week is over, I have survived it with only minor damage and the addition of a new hobby- crochet. All of this has nothing to do with the Brontës and so, I’ll move on to something I read this morning which struck me as very odd. That really must be confusing. I’m thinking especially of the Patrick Bronte and Arthur Nicholls crossover. Just how is that supposed to work? I can’t help but think that it would make one of them seem totally nuts. “That soundrel! I don’t ever want to see him in this house again!” “Oh please, let me stay-” “No, I say!” Or something more accurate and meaningful but along those same lines. Still, it is a shame I cannot see this. Mr Rochester is easier to work in since he is a composite of imagination and experiences of character like most fictional creations. 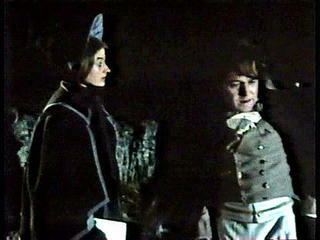 There could be a little of ..most of them (Mr.Nicholls excepted) in his character. It would probably come across as though there had only ever been one man in Charlotte’s life- at least he doesn’t also play Messrs. Smith, Williams, Taylor, and Thackeray too. I had to return most of the Brontë books I took out, alas. I did renew the ones by Juliet Barker because they’re so interesting ‘light’ reading! 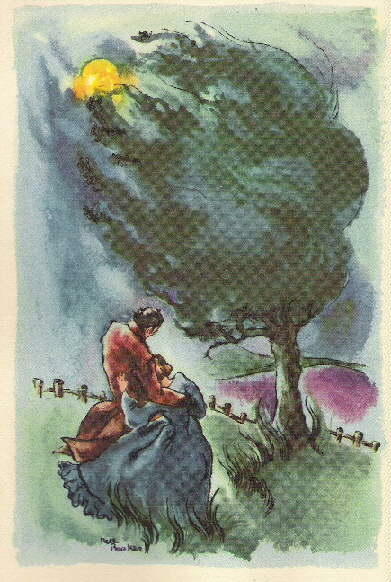 I’m going to try once again, to continue my project to share all of the illustrated Brontë lovliness I have hoarded away on my PC. These are some of my favourites, illustrated by John Huehnergarth in 1954. The glorious Kristin sent them to me, along with other things to keep up my obsession- I mean… collection. I have collected a lot of illustrations but have only come across two like the one on the left, which illustrate Mr Rochester’s affairs on the continent. The other is from the 1940s. The edition is one of my favourites. There are many beautiful illustrations which cleverly comment upon the action in the text itself. These are good examples, but there are several ways he goes about t his. The expressions of these illustrations are what speak for the accompaning text. The one on the right is straight-forward, it seems. But if you read more into it, the illustrator has answered the question a few readers might have- would Mr Rochester make a good father? The other is more tricky. He certainly seems rather ridiculous, and flattered I think, by Celine’s vivacious clinging. In the context of Mr Rochester’s narrative, this image has strong ironic overtones. …This is not funny! Not funny at all! If only it were that simple! (In fact has nothing at all to do with the Brontës). George Elliot appears to be extremely popular in Canadian academia nowadays, but courses on the Brontës are scarce. I’ve found one so far and it has been cancelled. Nell Booker illustrations, and P.B.B. Here are a few illustrations from a 1946 edition of Jane Eyre, illustrated by Nell Booker, with introduction by May Lamberton Becker. Apparently “a Rainbow Classic”. *insert other illustrations here… Blogger is once again giving me grief! eheu! I’ll try again this evening. In other news, I was tired of studying this evening and so I took a peek at ‘Poems of Patrick Branwell Brontë’ or rather the introduction. I didn’t feel justified in reading the poems themselves since I really do need to study for midterm exams, but the introduction was an interesting read… Especially the declaration: “Branwell was the second best poet among the Brontës.” A pretty strong statement! I have read a few poems by Branwell in my travels. Several were quite good and one was plain awful. It seems to me that people are in the habit of saying ridiculous things about Branwell and his work. I recall reading an article for a seminar which declared that, under certain circumstances (hinting that this applied only to Branwell) “the Parsonage produced trash.” I cannot say that I’ve seen such language used in literary criticism elsewhere, and it is shocking. Here’s the longest article I have on this particular production and it isn’t really about the production at all. It carefully sidesteps it entirely! Instead we get to hear two pretty nutty views on Jane Eyre. Some of it even crosses the line from nutty to offensive. John Braine, author of Room at the Top, thinks that Charlotte Brontë’s Jane Eyre had a great influence on his own writing- and on his own Yorkshire childhood generally. I met him at his office in Woking, Surrey, a cramped broom closet kind of a room which just manages to hold his own desk- a place of work a long way from Joe Lampton’s idea of the de luxe. Speaking of Charlotte Brontë, the 51-year-old author mellows and almost the apolectically angry television pundit one so often sees ripping the innards out of left-wing ideas fades away. Charlotte Brontë made me realise that the only real materail for a writer is what he knows best. There’s no need to go looking for exotic backgrounds you don’t understand. I came from Bingley, Yorkshire, and from my attic window I could see the beginning of the moors to Haworth where the Brontës lived, and I used to walk the road that Charlotte used to take to get out there, the very self-same road. ‘Jane Eyre is really a liberated girl,’ he says admiringly, ‘but not an immoral girl- far from it- a stauch Christian. But though her morals are conventional enough, she doesn’t have any feelings at all about Rochester’s lurid past. She knows Rochester is a middle-aged rake, but in this she’s curiously modern. She goes for the old rake with a bit of experience. But she always appeals to Rochester on exactly equal terms and when they’re talking as man and woman. There is a theory that in Jane Eyre we have the perfect example of the repressed Victorian woman’s fantasy emasculation of the overbearing male (she did after all, s it’s exponents explain, end up with a blind, half-maimed man she had to lead by the hand). Braine dismissed this with a return to his gritty, angry Yorkshire persona. ‘What a load of rubbish. Rochester was quite able to find one part of her. Theirs is a genuine, overwhelming passion- something there wasn’t much of in the English novel of the 19th century. Jane didn’t have any desire to make him helpless. Even blind, he had the same appeal for her because he was still so masculine. ~interview with Phyllis Bentley~Phyllis Bentley, a spry, white-haired Yorkshirewoman just turned 70, spoke affectionately of Charlotte Brontë, Jane Eyre’s creator, as she drove me at a brisk pace around the steep hills of her native Halifax in her bright new red car. With some satisfaction, Miss Bentley said that the thousands of American tourists who come to visit the Haworth pasonage where the Brontës lived tend to buy one of her Brontë biographies on the way (she has written two of them). Miss Bentley is convinced tht Jane Eyre would not have felt out of place working in Leeds or Halifax today. Not only was she fully modern, but she was spirited. In many ways, the Halifax authoress prefers ‘spirited’ women to the more militant variety. She feels that today’s women still long for a man like Rochester who is strong spirit and soul. (Michael Jayston, who plays Mr Rochester, in front of Norton Conyers. 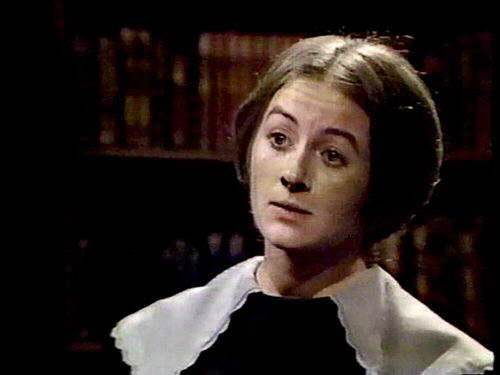 Sorcha Cusack, who plays Jane, in front of Brontë cottages at Cowan Bridge). At last, I am free! I've been running student elections under quite trying circumstances. Today's events are Brontë related, and so, here we go! I had a 3 hour shift running a polling station, and what better way to pass away the tedium than to read some books about the Brontës? I had left my copy of Agnes Grey at home, but I've memorised where their section is in the library. I scooped up a few, and was checking them out when a classmate stopped me to ask about an upcoming paper. We sat down in the coffee house to talk it over. She saw the books and exclaimed: "Oh God, you're reading that?" Of course, I was. 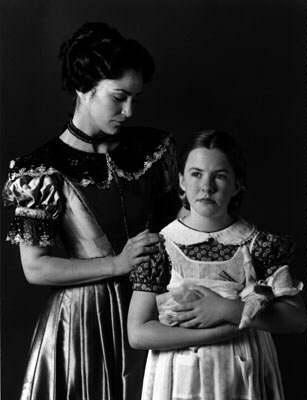 "The Brontës. I don't mind them," she continued. After a pensive moment: "I read that one… by that one… 'Withering Heights!' I read that. I didn't mind that one." 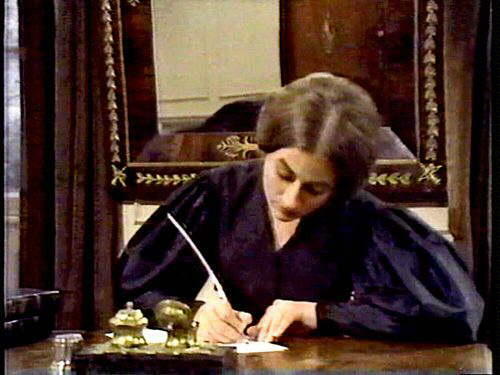 I proceed to astound her by announcing my intention to study the Brontës and Victorian literature. "The Brontës are Victorian?!" …I'm finding it difficult to conceptualise the Brontës NOT being Victorian. A few weeks back I had a very different experience. That time I had the Helen Jerome play, an illustrated copy of Jane Eyre, Barker's 'The Brontes,' Agnes Grey, the poems of Branwell Bronte and… a few other things. 😉 I staggered into class, and put the pile down on my desk. Someone next to me immediately cried out and snatched Jane Eyre from the top of the pile declaring it her absolute favourite. I was the astounded one this time- it has been my experience that people generally don't even know who the Brontës are- or if they do, they think of Emily and Wuthering Heights (or Withering… ;). I was even more shocked because after her cry someone nearby seconded this, and so we three rejoiced and lamented the general lack of Brontë-love. "How could you not love this book?" One of them demanded, reflecting on her experience in high school. I've noticed one interesting thing… Whenever I'm caught reading the Brontës people tend to ask me if I'm reading for pleasure. Thisbeciel sent me this, which appalled but amused me. I think I’ve heard the music for this. I may have. I’ve heard that there are something like 30 musicals of Jane Eyre alone, but I only know the magnificent one… and the “feel-good 1960s one” (with peppy Mr Brocklehurst enthusing about the lack of lunch at Lowood!). There will be no lunch! *sparkle jump! * bad, bad, bad mental pictures… Also, I think Rochester’s proposal song is called “I have Something Stupid to Tell You.” Anyway, here’s my response to Thisbeciel’s report. Rochester: You say “farewell”. I find I need more than that. I need… (He gives her a gentle kiss)I needed that. Now go. Jane: (totally confused) I don’t know what to say. Rochester: And that is exactly when you should find the strength to say nothing. Rochester: Tell him that the mangoes still seem to be sickly though. *This joke will only make sense if you’ve listened to Mystery Theatre Jane Eyre, and read the comments to this post.